CD review: "Passions of Man: The Complete Atlantic Recordings"
Forty years after much of Charles Mingus' most influential work was recorded, it remains startlingly modern and challenging. Had his recordings been made in secret and never before heard only to be released now, they would provoke the same kind of admiration and awe today as they did back then. Unconstrained by form or tradition, Mingus was a composer and leader who bowed the music to his will. Mingus wasn't a firebrand radical like the free-jazz revolutionaries who followed: He had no need to reject structure, for he was able to work within it to make it heed his call. And so his music is both challenging and accessible in a way avant-garde composers were never able to approach. It is the combination of a music that both embraces and pushes the listener that puts Mingus' work on a plane with that of the great classical composers. Like a Franz Liszt or Sergey Rachmaninoff, Mingus' compositions require virtuosity by the musicians, they also hold a great warmth for the listener. A new boxed set from Rhino lends weight and gives context to Mingus' contributions to modern music. 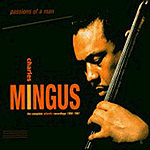 "Passions of a Man" traces some of Mingus' most creative years, 1956-61, when he was with Atlantic Records. Five discs of music and one of interview are accompanied by a beautifully illustrated  both with photographs and words  120-page booklet that provides a variety of thoughts on what Mingus left us. Among those contributing essays to the book are Mingus' widow, Sue; producers Joel Dorn and Tom Dowd; jazz historian Andrew Homzy; and musicologist Stefano Zenni. There is a complete discography (with original LP cover photos and liner notes by writers such as Nat Hentoff and Robert Palmer), a track-by-track analysis, and a bibliography for anyone who would learn more. But for those who would know Charles Mingus  at least as composer, bassist, pianist, singer, arranger  the heart of what you seek is here, in these six discs and booklet.